Turn left by the Total Garage lights signposted for Tyldesley. Follow this road for (A577) for two miles and this will take you into Tyldesley town centre. We are just next to the first pelican crossing. Parking is available on Mary Street. Come off at Junction 4 and head for the A6 towards Manchester. Continue until the first set of lights at Little Hulton and turn right. Carry on until the mini roundabout at the end of Mort Lane. Turn right here onto the A577 and follow this for about a mile and a half into Tyldesley town centre. We are on the left hand side near the first pelican crossing. 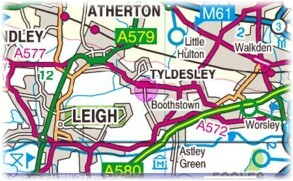 Come off the M60 at the Worsley junction and head up towards Boothstown, Leigh direction (A572). Follow this road and cross the A580 East Lancs Road. Now you will be on the A577. Follow this road for 2 miles and you will be in Tyldesley town centre. we are before the first pelican crossing on the left. Parking is available on Mary Street.